Impact Firestop Solutions Ltd. provides specialized services in sealing holes and joints for all walls and floors in and outside of any building, complying to the most updated laws and regulations in the construction industry. Smoke and flames find their way through a building with incredible speed. Even the best active fire prevention systems such as smoke detectors, alarms and sprinklers, can be rendered ineffective by lack of power, inadequate water pressure, or improper maintenance. The results can be disastrous... loss of property, business, and worst of all, loss of life. Because "Active" fire prevention methods can fail when they are needed most, Alberta Building Codes now require the use of "Passive" fire prevention systems known as "Firestopping Materials." Their purpose is to compartmentalize and contain a fire to its smallest possible area without the help of any secondary systems. Fire safety can only be guaranteed if the proper products are used in the appropriate manner. Often, sub-trades use unsuitable materials in untested ways simply due to lack of education. 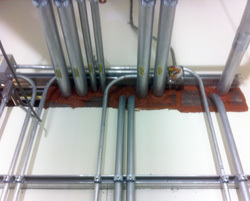 Only an accredited firestop contractor is knowledgeable in the many different types of firestopping materials, applications and techniques. Seventy percent of all fire-related deaths are caused by smoke inhalation. 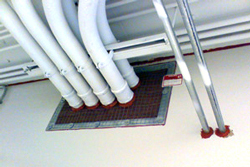 Without properly firestopping your facility, toxic gases can pass from room to room via wall and floor penetrations. Not only does firestopping save lives, it protects your investment from smoke damage. Firestopping is the installation of building materials such as sealants, mortar, foam, collars, blocks and boards specially-designed to prevent the movement of flame or gases to other areas of a building through small concealed spaces in building components such as floors, walls, and stairs. 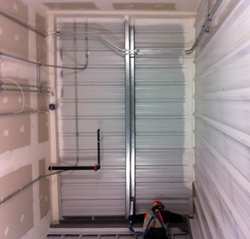 A system consists of assemblies and/or materials designed to prevent the spread of fire through openings. These openings include, but are not limited to, electrical conduits, cable, cable trays, and metal and plastic pipes, wall gaps, etc. What types of facilities require firestopping?